We just delivered a massive vintage Renaissance dining table to Crystal B. in Harlem, Georgia. Crystal found us on Ebay and let us know that she had been searching for the perfect table for her large, open kitchen for the past 4 years! It’s a charming kitchen so let’s take a look at the table and its new home.. This is the large Renaissance style vintage French dining table Crystal bought from our selection of new, vintage and antique dining tables. It was crafted circa 1950 with a beautiful golden parquet top and an ornate wrought iron stretcher that adds to the Renaissance feel. This end view might give you a better look at the square parquet design on the table top. 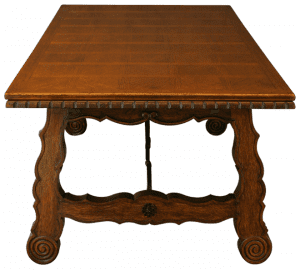 You can also see how the darker wood base and legs are carved with traditional rope, leaf, and scroll motifs. Here’s the vintage Renaissance table in Crystal’s kitchen. We’re glad we were able to help her find the perfect piece to complement her décor! Take a look at the beautiful window treatments, which Crystal made herself — freehand! — and notice how the black, green and mauve fabric ties it all together. And what a gorgeous view this handsome vintage Renaissance table with its massive carved legs will enjoy through the three large, nearly floor-to-ceiling windows! It is hard to tell in the photograph, but in person we could see that the leaves were beginning to show the full range of vibrant autumn colors – reds, yellows and oranges. 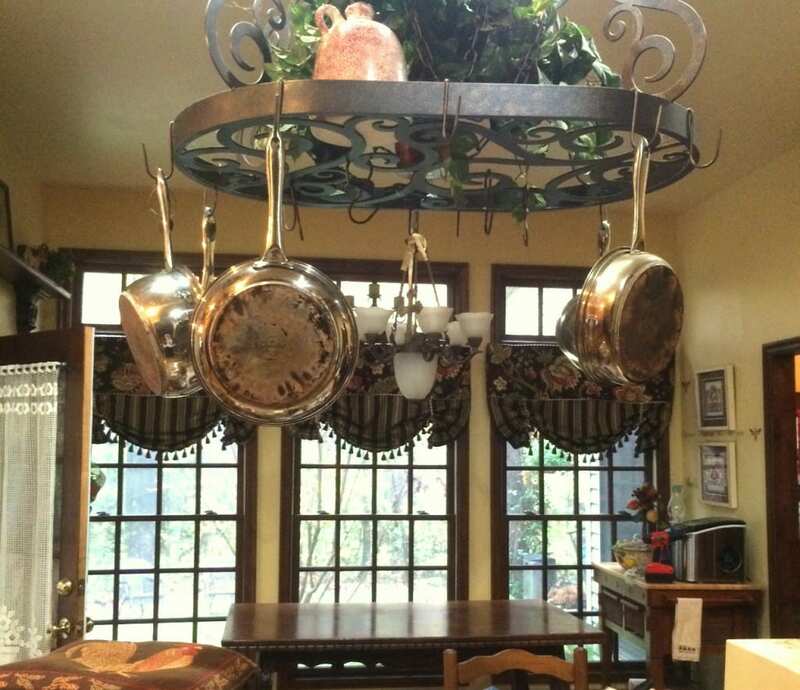 The black wrought iron stretcher under the vintage table ties in with this stunning black wrought iron pot rack over Crystal’s island. This traditional kitchen is packed with “welcome home” appeal, combining handsome looks with warm comfort. What a lovely spot to enjoy a cup of coffee and perhaps a hearty bowl of oatmeal for breakfast! Thank you Crystal for giving us a glimpse into your home. We agree that you DID find the perfect table at last and we hope you enjoy it for many years! 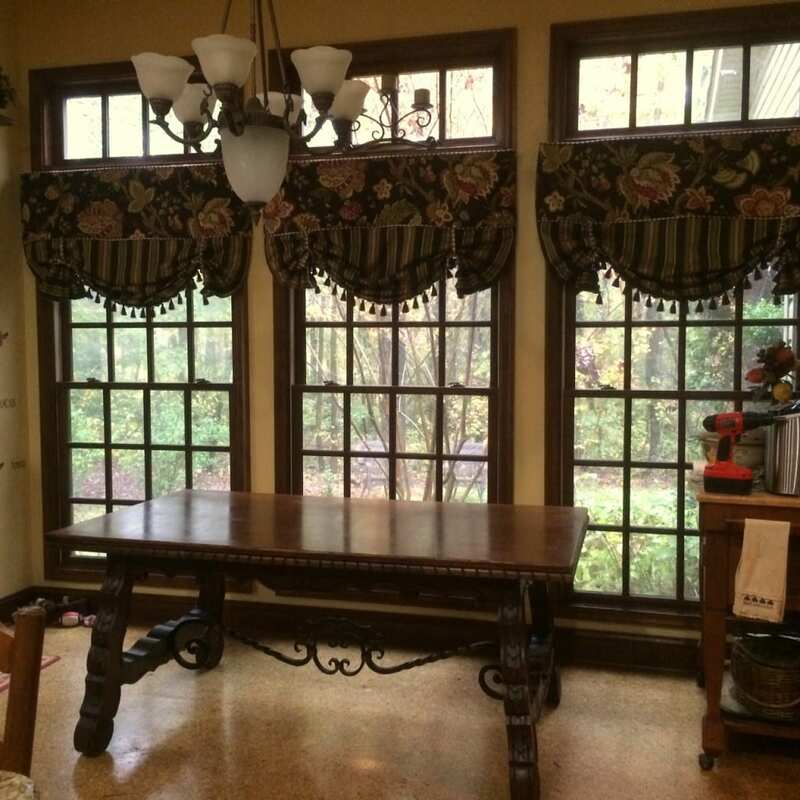 This entry was posted in Client Spotlight and tagged 1950s vintage, antique dining table, Antique Renaissance furniture, French Vintage Furniture, how to blend antiques into decor, kitchen, parquet wood, Renaissance table, Vintage French furniture, vintage table, Wrought iron on November 9, 2015 by admin.